Jane Kiley’s New Book “Rogeen An Irish Love Story” is the Story of a Woman Torn Between Two Worlds and the Love of Two Men. Recent release “Rogeen An Irish Love Story” from Page Publishing author, Jane Kiley, is about a woman named Sierra who falls in love in Ireland and when she returns to Chicago, meets a new man. As she struggles with her emotions for both, the situation complicates and consumes her life, ultimately turning it upside down. Jane Kiley, a freelance writer who worked in the travel industry for over twenty five years and traveled to Ireland many times, has completed her new book “Rogeen An Irish Love Story”: an emotional journey about a woman named Sierra who falls in love in Ireland and when she returns to Chicago, meets a new man. As she struggles with her emotions for both, the situation complicates and consumes her life, ultimately turning it upside down. Published by New York City-based Page Publishing, Jane Kiley’s emotional tale’s protagonist, Sierra, always considered herself an adventurous, spontaneous person. So, when she discovers an article about a single’s festival in Ireland it sparks her curiosity. Unknowing to what the trip would bring, she and her friend, Kathy embark on a journey across the sea to attend the festival. While in Ireland, Sierra meets a handsome, Irish farmer named Shane. She had not planned on falling so hard for a man in such a short period of time, but she does. So much so, that as she travels back home to Chicago, she can’t seem to get him out of her mind. Although Sierra meets a new man while back in Chicago, Shane is still in the depths of her heart. Sierra struggles to choose between the love of two men and two completely different worlds. 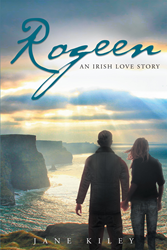 Readers who wish to experience this romantic work can purchase “Rogeen An Irish Love Story” at bookstores everywhere, or online at the Apple iTunes store, Amazon, Google Play or Barnes and Noble.